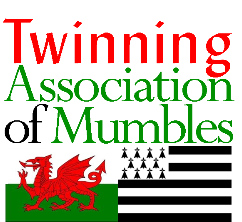 Copyright © Twinning Association of Mumbles. Powered by Serif. 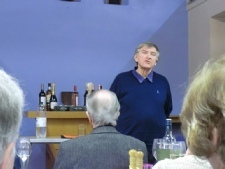 On Friday 24 March Professor Peter Stead gave us a third success in TAM’s series of fund-raising talks at Norton Village Hall. In a very funny talk about his lifelong love of travel and literature, he recommended keeping lists (how many countries/cities/football stadiums/ concert halls/whatever have I been to?) as an effective way of curating memories and experiences. He also argued that reading great travel writers both before and after a visit brought far more benefit than using a conventional travel guide during the visit. We are most grateful to Peter for his time and words of wisdom and also to our wonderful cooks Anne Winks, Lyn Jones, Isabel Hopgood and Sarah Lever for a delicious hot tagine supper. 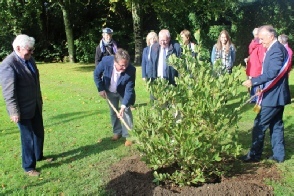 In September 2015 during the ten-year anniversary celebrations of the twinning link between Mumbles and Hennebont, a magnolia was planted in the Bois du Duc at Hennebont by the mayor, Mr André Hartereau, with representatives of TAM and Mumbles Community Council. The photographs show, above, the planting ceremony in 2015 and, below, the young tree in bloom taken a few days ago in March 2017. 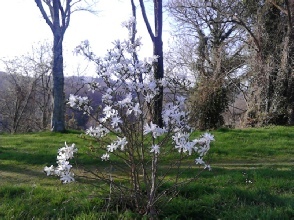 Many thanks to René Guerin for sending us the new picture: l’arbre de jumelage (the twinning tree). Audience-eye view of Peter Stead in full flow. Fine wines in background donated by members for raffle. Photograph by Keith Turner.